Adam Holland: Anti-Israel activist supports checkpoints . . . in the U.K.
Anti-Israel activist supports checkpoints . . . in the U.K. While "Lowkey" tempers his call for vigilante checkpoints with the non sequitur insertion of a boilerplate call to end foreign wars and fund domestic programs, it does seem oddly out of character for this opponent of checkpoints in the West Bank to support of them in London. When Israeli neighborhoods are threatened with senseless violence, he sees the use of checkpoints to defend them to be a crime against humanity. When his neighborhood is threatened, the utility of checkpoints becomes evident. That video, which is posted to YouTube under the headline "lowkey arab british rapper protesting against jew zionist genocide in palestine", shows the rap that contemporaneous press accounts say motivated a mob of several dozen of his audience members to loot and vandalize nearby Starbucks shops. (Read here and here.) The mob was inspired to do this by Lowkey's absurd statement that "You say you know about the Zionist lobby, but you put money in their pockets every time you’re buying their coffee." While I don't claim to be a critic of hip hop, I know enough to be able to say for certain that Lowkey's fame, such as it is, does not derive from his skills as a rapper. His incompetence in this regard would get him laughed out of the hip hop marketplace here in the U.S. 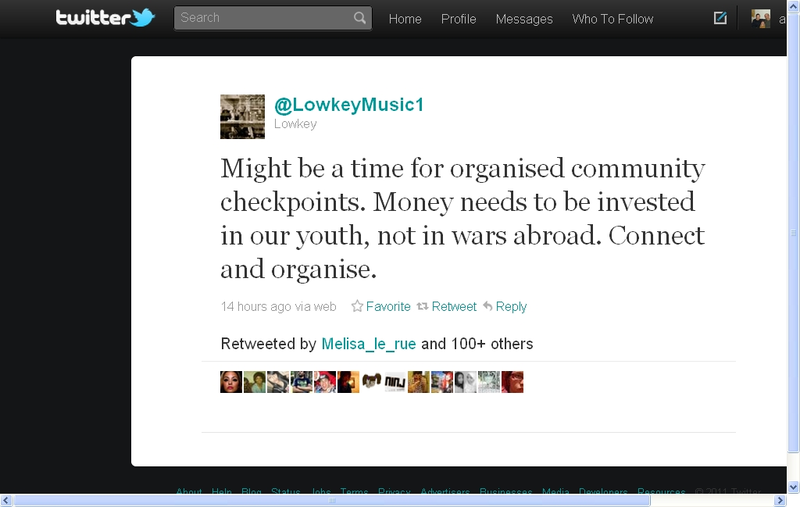 While I strongly believe that Lowkey is known solely for his political activism, not for his rapping, the statement of support he received from noted hip hop impresario Tony Benn may speak to the contrary position. Benn wrote of one of Lowkey's records that it "speaks to people about the struggle of the Palestinians and their fight for freedom. By buying it you, your friends and your colleagues can show support for the Palestinian people in their hour of need. The single is supported by Stop the War Coalition, Palestine Solidarity Campaign and Viva Palestina. I hope we can count on yours too". Tony Benn says to buy Lowkey's record to show your support for the Palestinian people, although he doesn't specify exactly how this support will reach them. In that respect, it has a lot in common with donations made to Viva Palestina. Keepin' it real, Tony. Lowkey's proposal that London residents set up neighborhood roadblocks of the kind set up in Cairo last spring is an extremely foolish idea which nobody should take seriously enough to attempt. What London needs least right now is more mob violence. That such an idea comes from someone who has encouraged such violence in the past by spreading false conspiracy theories speaks to the poor judgement behind it. Out of morbid curiosity (which I have a surplus of nowadays), I decided to check out the alleged Starbucks-Israel connection. From 'Boycott Israel Campaign', I've learned a startling amount of things. For one thing, most of the links and articles they cite either don't work, or when punched into a search engine, reveal only identical citations (such as regarding Schultz and anti-semitism). Incredible illuminations are brought to light due to the sites investigations. Apparently, Shultz received a award from Aish HaTorah at one point, that he supports Jewish activities in the US, and the ADL defended him from charges of being an arm of Zionism. Truly dedicated work that shows all of the investigators intelligence and dedication. I'm a bit disappointed in Lowkey, to be honest; you'd think anti-Israel activists would be a bit more grounded in reality. Or at the least come up with more entertaining conspiracy theories. How does that video show that he is instigating mob violence? Lowkey equated several businesses with the Israeli military, literally claiming that doing business with them puts bullets in Israeli guns aimed at Palestinians. His list included Starbucks, which, as Benjamin commented above, had only minimal. connection to Israel, none of them remotely giving bullets to anyone. Shortly after that performance, mobs left the rally to attack two Starbucks stores in the area. You may consider this a coincidence, but I see Lowkey''s actions to have been a provocation, perhaps inspired by bigotry against Starbucks' Jewish CEO. Gaza ceasefire in the works? Are Ron Paul supporters a cult?